In order to qualify the initiative for the ballot, C.A.R. must collect approximately one million signatures from California registered voters. Petitions were mailed to each C.A.R. member in early January, urging them to sign the petition and to obtain four additional signatures of registered voters within the same county, and mail it back to C.A.R. People are responding enthusiastically to the measure, but C.A.R. also has received a fair number of questions regarding this initiative and how it works, especially in relation to Props. 13, 60, and 90. We hope this short Q&A will help answer those questions. Why is the Property Tax Fairness Initiative Needed? It’s no secret that California is in the midst of a housing crisis. Not only is affordability near an all-time low, but housing inventory remains stubbornly low – wreaking havoc on the market and reducing homeownership opportunities for many would-be buyers in California. On top of these challenges, nearly three-quarters of homeowners 55 years of age or older have not moved since 2000, furthering constricting inventory. Research has indicated that one of the primary reasons these homeowners are effectively “locked” into their homes is the prospect of paying higher property taxes. C.A.R.’s Property Tax Fairness Initiative will help these homeowners sell their current homes and move without being subjected to what is effectively a massive “moving penalty.” These homes will then be available for families and other would-be buyers to purchase. How Do Property Tax Assessments Currently Work? The amount a homeowner pays in property taxes is based on the assessed value of the home at the time of purchase. Generally, Prop. 13 limits property taxes to 1 percent of the assessed value at the time of purchase, even if the value of the property subsequently increases. Prop. 13 is a California proposition that limits the property tax rate to 1 percent for all California property and annual tax increases to no more than 2 percent. This protects homeowners from losing their homes due to unforeseen property tax increases. There also are two other propositions that affect property taxes – Prop. 60 and Prop. 90. Prop. 60 allows senior homeowners, 55 years of age or older, to transfer their property tax base – one time -- to another home in the same county, as long as the purchase price of the replacement home is equal to, or less than, the sale price of the original residence. Prop. 90 is an extension of the original Prop. 60 program. Prop. 90 allows senior homeowners to transfer their property tax base, one time, to a home in a different county, as long as the county accepts such transfers. For more information about C.A.R.’s Property Tax Fairness Initiative, visit on.car.org/portability2018 or send us an email at portability@car.org. This message was sent to Gordon@thescotsman.com. Visit your subscription management page to update your email preferences. C.A.R. does not in any way endorse or sponsor any product or service or vendor mentioned herein unless expressly stated. If you wish to update the email address to which this newsletter is sent, please do not reply to this email. EMAIL ADDRESS change requests must be directed to your local association. QUESTIONS OR COMMENTS: contact C.A.R. Copyright © 2018 CALIFORNIA ASSOCIATION OF REALTORS® (C.A.R. ), All rights reserved. 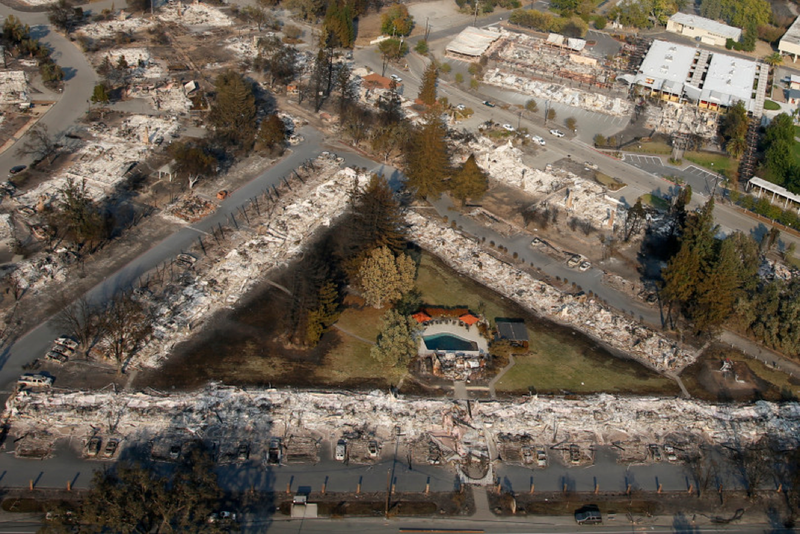 My daughter, age 25, lived in the Estancia Apartments on Old Redwood Highway in Santa Rosa. She lost her apartment and all her belongings early on October 9. At 1:30 in the morning the power went out and shortly after that there were sirens on the frontage road and emergency vehicles with bullhorns yelling for everyone to evacuate. She had only a few minutes to locate her purse, shoes, and dog before leaving. She had to return to the apartment to get her keys. She left everything behind. She forgot to lock the door. She was one of the first people to leave the complex. There was no direction of where to go, the first responders just said to leave. She called her friend who said to go south so that's what she did. She tried to get to the freeway, highway 101 and there was a traffic jam. She finally made it to the freeway. There was fire on both sides of the road and embers blowing across the road. 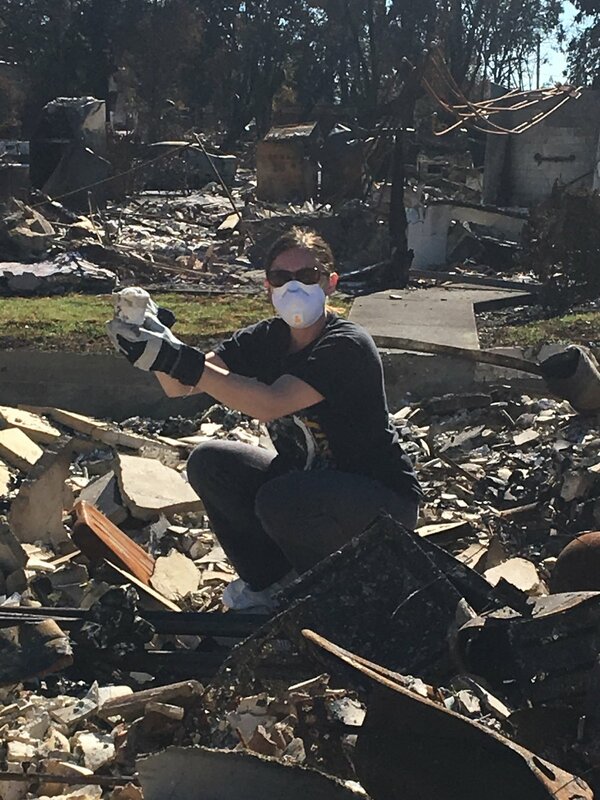 She could barely see because of all the smoke. She almost turned around because ahead of her cars were turning around and driving back the other direction in the carpool lane. Her friend told her to keep driving south, that there was no fire, so keep driving south. Luckily that's what she did. It took about an hour for her to drive about 5 miles but she was out of danger. At about 8am she drove to Livermore. The next day we learned her apartment burned to the ground along with all her belongings. The weekend before (October 8) she was home and cleaned out her bedroom of everything that was important to her and took it to Santa Rosa. Everything was lost in the fire. All her childhood memories, all her Christmas ornaments and decorations she has collected over the years, her souveniers from vacations and a trip to Europe right after high school, all gone. She took my grandmother's china and some of that survived but most was broken. We are lucky and count our blessings every day that we have our daughter, happy and healthy and thriving. She went back to Santa Rosa one week ago and is temporarily living in a mini apartment until something becomes available. (The best gift for victims at this point is gift cards). There is no place to store 'stuff' until more permanent housing becomes available. Everyone has been so kind and compassionate through this ordeal. My daughter is very resilient. She is a CPA so I have purchased her a new work wardrobe, casual wardrobe, stuff for her dog, coats, basics, kitchen necessities, etc. probably spent several thousand dollars. I would do it again in a heartbeat. You cannot put a price tag on your child's life. It is priceless. She left with her dog and car and that is all. We are so lucky and blessed. Thank you for putting the word out that the victims need help. Unfortunately since my daughter has a decent job she does not qualify for any help from FEMA, United Way or any other government organization. Friends and family have been a godsend. Thanks, this is a tragic story and all to common I'm afraid. For thousands this will not be a happy festive season. Can you help please. Please email gordon@thescotsman.com subject donations, and I will pick up. We thank you in advance. New Tax Reform could damage our property values! The current tax reform planwould weaken the tax incentives for owning a home, such as the mortgage interest deduction. Also it tax will increase taxes on middle-class homeowners through the elimination of the state and local tax deduction. The tax reform framework recently released by congressional leaders and the White House promises to lower taxes for the middle class and to create economic growth. However, by repealing the deduction for state and local taxes, as well as most other deductions, while raising the standard deduction, it would eliminate the time-honored tax incentives of owning a home for 95 percent of current and prospective homeowners. It could also lower the value of all homes by more than 10 percent and damage growth. Further, because this kind of tax reform would repeal personal and dependency exemptions, millions of middle-income home-owning families could end up paying more tax. Homeowners already pay 83 percent of all federal income taxes, and this should not go higher in order to fund a tax cut for corporations. Tax reform is important, but should first, do no harm. We do need to reform the tax code AND protect middle class homeowners but not turn America from a home-owning nation to a home-renting nation!